What’s the difference between Single brand vs Multibrand retail? · Nike Company opens outlets in A’bad, Banglore, Delhi and Mumbai selling nothing but Nike Shoes, Nike wrist-watches and Nike t-shirts only. · This is single brand retail. · FDI in Single-Brand Retailing was permitted in 2006, to the extent of 51%. · These were mostly outlets for sportswear, luxury goods, apparel, fashion clothing, jewellery, hand bags, life-style products. garment store to get Nike or Adidas. · Big Bazaar opens mall in above cities: selling t-shirts of multiple-brands such as Reebok, Nike, Adidas, Allen Solley, Van Huesen, Peter England etc. · So this is multi-brand retail: when an outlet sells a product (tshirt, tie, shoes anything) of more than one brand. 1. Retail sector in India is the second largest employer after agriculture. Almost 33 million people involved here. the production still remains 200 kgs. Same problem goes with family owned-operated retail stores, the intermediaries and middle agents. in other sectors. This FDI will lead to unemployment. 1. Walmart cannot open malls in every nook and corner of India. Their electricity, staff and security costs will surpass their profit margins. on small purchase. So they’ll be using local small-retailer for daily requirements of bread, milk, newspaper etc. started running Xerox and cybercafés. 4. Did local Udipi owner ran out of business because of McDonald / KFC? Ofcourse not. · Walmart or any other MNC retail mall, for the first 3-4 years they’ll give heavy discounts and seductive offers, even if they make loss in the deal. Result : all the customers in a particular city are hooked to walmart only. ‘predatory pricing’ Walmart will slowly stop giving discounts and recover their losses by increasing the MRP. · Since these big MNCs have deep pockets, they can affort this sort of loss. But in the long term, they recover everything. now Wal-Mart is the sole retailer in the city. because the mall is giving Rs.3 discount on apple juice. · (sidenote) Another example of Predatory pricing is our airline industry. One of the prime reasons why they’re making losses. of local Indian pen-producers and to capture the Indian stationary market. · China is notorious for this dumping tactic, earlier we had to impose Anti-dumping duty on their rubber products and tires. · Some believe that entry of Foreign retailers will facilitate the Chinese scheme of dumping our market with their cheap products. importantly, if we are second largest producer, then why is so much inflation in food items? · More than 50% of this can be saved, if we’ve proper cold-storage facilities. donot have much money to invest in this cold-storage chain or those expensive big transport-trucks of America that we see in Discovery channel. supply of fruits and vegetables. According to supply-demand rule the prices will go down. the produce as well in their retail malls, they’ll feel interested in investing in this cold-storage game. · Similarly FDI in Wholesale trading was allowed upto 100% since 1997.
trucks. Once this overloaded truck goes through checkpoint, policeman will demand bribe for flouting the road permit provisions. · Since the truck is overloaded, engine efficiency is reduced. He has to get his truck repaired frequently. · The road quality and traffic Management is bad, more diesel is consumed. · Trucker will add all these costs (bribe, repair, extra diesel) in his service charge. trucks, there is very systematic packing of goods. His truck maintenance cost is thus very low and there is low wastage during transport. 1. There is no overloading of trucks, papers are in order. Less chances for policemen etc to blackmail him into paying bribe. 2. He got deep pockets, he gives big annual donations for ‘election funds’ to the ruling party and Diwali gifts to the concerned district officers. So MNC retailer’s cost price is quite low compared to small-time retailers. Hence he can afford to give attractive discounts to customers as well. big player. Big player is less susceptible to arm-twisting compared to a small player. even in open auctions, farmers don’t get good price for their produce. · Wholesale regulated markets, governed by State APMC Acts, have developed a monopolistic and non-transparent character. hardly anything positive reform done for the students. farmers in nations with a higher share of organized retail. producer) = Same reason, Non-competitiveness. Bad supply lines. · A price that the farmer receives for a typical horticulture product is only 12–15 per cent of the price the consumer pays at a retail outlet. products. Big mall with big floor space, provides them opportunity to market their products and get customer’s attention. · More than 40% of the medicines sold in rural and semi-urban areas of India are of fake brands. · For an MNC retailer you can atleast feel confident that it won’t be the case. · Remember once upon a time, Mobile calls used to cost 7 Rupees per minute and “incoming” wasn’t free. Why? Because there was low level of competition. Barely 2-3 players in the market. FDI can be a powerful catalyst to spur competition. · To open a big mall, walmart has to purchase land and construct a big building= lot of laborers, masons, plumbers, electricians employed. · This is trickle down theory. Marxist and Vinod Dua (NDTV) disputes this theory. 1. Entry of foreign players must be gradual with social safeguards so that the effects of labour dislocation can be analysed and policy fine tuned. 2. Foreign players should initially be allowed only in metros cities only. 3. Gradual opening of the retail sector over a period of 3-5 years to give domestic industry enough time to adjust to the changes. 5. Regular monitoring of mall-inventories to see that India is not used as dumping ground for Chinese products. the entry of large organized retailers. 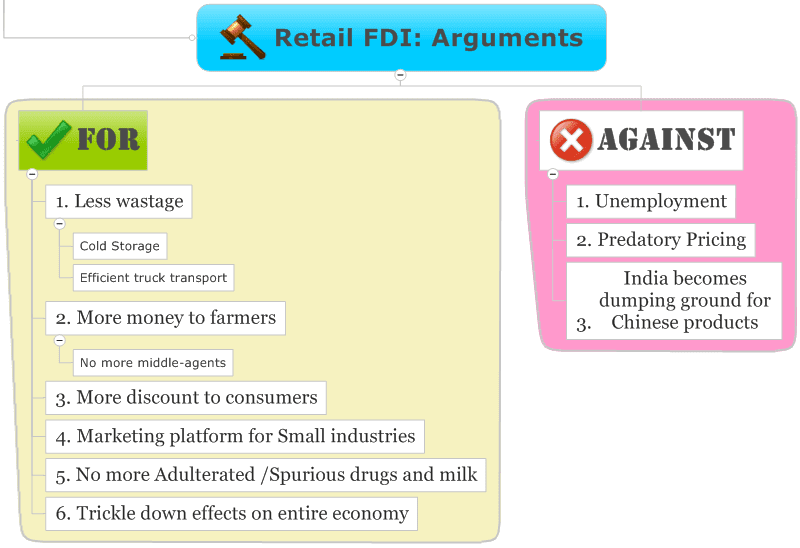 sector as a result of the entry of organized retailers. 4. There was competitive response from traditional retailers through improved business practices and technology upgradation. relatively more beneficial to the less well-off consumers. in response to increased business opportunities opened by the expansion of retail. · Thailand: Since 1997, 100% FDI. Positive result: Thailand has now become an important shopping and tourist destination.